The programme cover is available here. The programme text is available here. Direct download as an MP3 here (12:34, 17.4MB (right click and ‘Save target as…’)). Online streaming and alternative download formats are available here. Direct download as an MP3 here (15:25, 14.2MB (right click and ‘Save target as…’)). Direct download as an MP3 here (17:43, 16.4MB (right click and ‘Save target as…’)). Direct download as an MP3 here (12:29, 11.5MB (right click and ‘Save target as…’)). Direct download as an MP3 here (35:08, 32.2MB (right click and ‘Save target as…’)). Direct download as an MP3 here (18:40, 25.8MB (right click and ‘Save target as…’)). Direct download as an MP3 here (18:42, 25.9MB (right click and ‘Save target as…’)). Direct download as an MP3 here (07:26, 6.9MB (right click and ‘Save target as…’)). For more audio on graphic medicine, click here (external link). * – There is some background noise and music on this file due to the location of the recording, however, the speakers remain audible throughout. The manifesto entitled ‘Declaration of The New Vague’, which was included in the first issue of Solipsistic Pop and is discussed by the speakers is available to read online here. Comics Forum 2011 was reviewed by John Swogger here. Comics Forum 2011 was supported by Thought Bubble, the University of Chichester, the Henry Moore Institute, Dr Mel Gibson, Routledge, Arts Council England, Intellect and Molakoe Graphic Design. 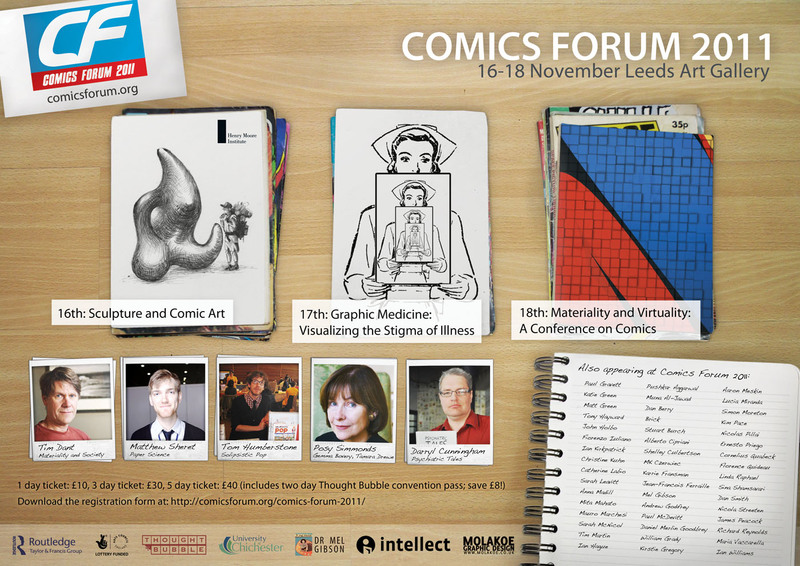 Jane Tolmie writes on graphic medicine in ‘Dealing With Illness? Read a Comic’; available here: http://www.huffingtonpost.ca/jane-tolmie/medical-comics_b_1002248.html. Sarah Leavitt, whose book ‘Tangles’ is mentioned in Jane’s post, will be appearing on day 2 of Comics Forum 2011.